Brelyna Maryon is a Dunmer mystic and a student at the College of Winterhold. She is most likely to be met during Tolfdir's lecture. Afterwards, she is found in the Hall of Attainment, sleeping from 10pm to 6am and studying there for the rest of the day. Attempting conversation with Brelyna during the lecture will fail, as she will tell you, "I'm trying to pay attention." When the class is over, you may now properly talk to her, though she will already explain everything to you: "Before you even ask, yes I have an ancestry steeped in magic, and no I don't want to talk about it. Yes, I know Winterhold used to be full of my kind, and no I don't care that they're all gone now." and end with, "Does that cover everything?" Saying that you have not really been introduced will gain a more friendly reply from her: "No, I suppose we haven't. Brelyna Maryon, of House Telvanni. First of my family to leave Morrowind in a long time. Now I'm here to study Conjuration. That's what's important." If you express your confusion, Brelyna will instead reply with, "I've just been asked enough questions. I'm here to learn, not to explain myself over and over." and promptly apologize, "Forgive me, I didn't mean to assume." Unlike her fellow students, Onmund and J'zargo, Brelyna tends to cast summoning spells and wards in combat. Because of this, she may be very useful if you seek a follower who will provide defenses and distractions. She is most skilled in Alteration, Illusion, Conjuration, Sneak, and Restoration in that order. She does not know any Illusion spells, however, and often uses Destruction spells as well as bows, despite having minimal Archery and Destruction skills. Her default clothing is an apprentice hood, apprentice robes of destruction, and boots. She also carries a staff of lightning bolts and a copy of the book Gods and Worship. Brelyna may greet you with, "You know, this is one of a very few places where you can receive a real education in the schools of magic. ", "I think my parents reserved a spot for me here at the College on the day I was born. ", or "There's a lot of pressure for me to excel in my studies. I hope I can live up to expectations." 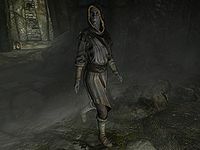 After the excavation at Saarthal, Brelyna may comment on the dangers of exploring Nordic ruins: "At least something good came out of that trip to Saarthal. I didn't find anything but dust." If you are Arch-Mage, Brelyna will surprisingly offer you a backhanded compliment: "I still can't believe it. You, the Arch-Mage? Never would have guessed it." 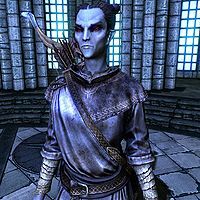 As Brelyna is from House Telvanni, known for its skill and dedication in magic, the pressure to succeed from her family results in her lack of confidence in her skills. You may ask her if she likes it here at the College, in which case she will agree: "So far, if only because no one is telling me how great I ought to be. I just want to learn, I don't want to think about what's expected of me." If asked, Brelyna will explain that Winterhold used to be full of Dark Elves, along with the reason they left: "Didn't you know? Before the Oblivion Crisis, many elves called Winterhold their home. More visited the College from Morrowind every year. After, growing distrust of magic made life difficult for many. Some left rather than endure the growing hatred from the local Nords. Others returned home after the Red Year, when Vvardenfell erupted and caused much destruction. Winterhold itself died in the years between then and now. What's left out there is a husk. Only the College really remains." After joining the College and completing Under Saarthal, Brelyna will request to test spells on you. If you agree and complete this minor quest, she will be available as a follower and you can marry her. She is also a potential Blades candidate. If you steal from the College while she is a follower, she will tolerate it at first, but eventually attack you if you do so too many times. First Lessons: Join the College of Winterhold. Under Saarthal: Uncover the mysteries beneath this ancient ruin. Brelyna's Practice: Help Brelyna Maryon by allowing her to practice her spells on you. Should you ask her, Brelyna will tell you what she knows about Ancano, Arch-Mage Aren's advisor: "I know I don't like the way he looks at me. I can't tell if he expects me to blow myself up, or to try and murder him. But he clearly doesn't trust any of us." After you meet with Quaranir, a Psijic monk, Brelyna will remark on it: "Is it true? One of the Psijics was here in the College?" You may inquire about the Augur of Dunlain, which will be replied with, "Huh? That sounds ominous. Are you getting yourself into even more trouble? Did you ask Mirabelle? She runs things around here, after all." During Revealing the Unseen, you will discover the location of the Staff of Magnus, but Brelyna will show skepticism: "So you're off to find some staff now? I don't see the point of that." 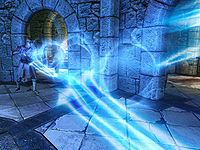 As Ancano releases the power of the Eye of Magnus, she will exclaim, "By Azura, what's happening?" You will then be tasked to retrieve the Staff, and Brelyna will still not be convinced of the Staff's importance, saying either "You really think the Staff of Magnus is the key?" or "How long can we keep this up?" When you set out to defeat Ancano, Brelyna will understandably be shocked over current events: "I can't believe any of this is happening!" "We wouldn't be here if we couldn't control magic!" Tolfdir: (to you) "Welcome, welcome! We were just beginning. Please, stay and listen." Tolfdir: "So, as I was saying, the first thing to understand is that magic is, by its very nature, volatile and dangerous. Unless you can control it, it can and will destroy you." Brelyna: "Sir, I think we all understand that fairly well. We wouldn't be here if we couldn't control magic!" Tolfdir: "Of course, my dear. Of course. You all certainly possess some inherent natural ability. That much is not being questioned. What I'm talking about is true control, mastery of magic. It takes years, if not decades, of practice and study." J'zargo: "Then what are we waiting for? Let's get started!" Tolfdir: "Please, please! This is exactly what I'm talking about. Eagerness must be tempered with caution, or else disaster is inevitable." Onmund: "But we've only just arrived here -- you've no idea what any of us are capable of. Why not give us a chance to show you what we can do?" Tolfdir will then approach you and ask, "You've been quiet so far. What do you think we should do?" 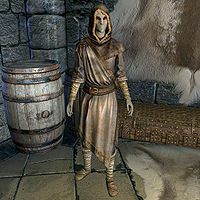 If you state that you should learn something practical, Tolfdir will reply with, "Is that so?" while Brelyna will add, "See? He/she agrees with us too! Why don't you actually show us something?" No matter your option, Tolfdir will eventually give in and ask you to cast a ward while he casts a spell against it. Brelyna and the other students will stand behind Tolfdir to watch the demonstration. "This is better than sitting around talking about magic, don't you think?" J'zargo: "What do you think we'll find in there?" Brelyna: "Can you believe we're here? Saarthal, of all places." Brelyna: "It's thousands of years old. Who knows what we might find?" Onmund: "I'm surprised that the College is allowed to excavate here." J'zargo: "I'm betting bodies. Lots and lots of bodies. And maybe some valuables..." Brelyna: "I bet your family would be amazed, right?" Brelyna: "Don't get any ideas. We're here on official business, remember?" Onmund: "Amazed isn't the right word. They might find this... offensive." When approached, Brelyna may say either "This is exciting, isn't it? ", "This is better than sitting around talking about magic, don't you think? ", or "To think, my ancestors destroyed the homes of Onmund's ancestors. So much bloodshed." Asking if she is nervous about being there will have her ask back, "Why? Because it's old, and full of dead things? Clearly you've never spent any time in Morrowind." She does not know much about Saarthal, however, as she will tell you, "Not really. Just that it's very, very old. It was one of the first cities of men in Tamriel, I think." Brelyna: "I'm not sure what I was expecting, but this isn't it." Brelyna: "This is a little creepy." J'zargo: "There's no gold, nothing shiny at all." Onmund: "That doesn't begin to describe it." Brelyna: "Don't sound so disappointed. You wouldn't be allowed to take it even if there was." Brelyna: "You seem uncomfortable being here." J'zargo: "Like anyone would even notice, in all this mess." Onmund: "I just don't know that it's right for us to be in here like this, picking through the ruins [sic]." "We're all trying to become better mages, right?" Back in the College, Brelyna has been working on a spell and needs someone to test it on: you. She will ask for your help: "If you have a moment, could you help me with something?" or if you have refused to help before, she will tell you, "I still need some help, if you can spare the time." You may approach her and ask what she needs help with, and she will elaborate: "We're all trying to become better mages, right? Well, I need someone I can practice a few spells on. Nothing dangerous, really. Would you be willing to assist me?" Refusing will be replied with, "Oh. Well, if you change your mind, let me know." Asking for rewards will have her say, "Well, I... I simply thought you might wish to help out one of your fellow mages." and reluctantly offer you, "If that's not enough, I suppose... I have this amulet you could take." Should you ask, she will also explain why she can't practice on herself: "No, not that kind of spell. Believe me when I say I wouldn't be asking if it weren't necessary." She will be relieved if you agree: "Oh, good. I was afraid I'd have to go ask J'zargo. Now, you just stand there..."
As she prepares to cast the spell, she will tell you to "Please hold still, and don't move." She will cast a flawed spell that causes your vision to become greenish, and exclaim, "There! Now, I..." She will then realize what she has done: "Oh dear. That wasn't supposed to happen." She will ask you worriedly, "Do you... do you feel all right? You look very, umm, green." Brelyna will then apologize, "I am so very sorry. I went over this again and again, and I was sure it would have better results." She will confirm, thankfully, that the effect is not permanent, saying, "It's not! It shouldn't be. You'll be back to normal in no time. And when you are, we can try this again and I'll be sure to get it right." If asked, she will tell you what she did: "I'm not really sure. I think it's just a minor miscalculation on my part. I'm sure it will wear off soon. When it does, you'll be perfectly fine, and then we can try again. In the meantime, I'll see about figuring out what went wrong." After waiting for the spell to wear off, you can tell this to her and she will confidently state, "Exactly as I said it would." and ask you, "Now, are you ready to try again? I am confident it will work this time." Simply saying that she can try again will have her assure you that "This will be worth it." You may instead tell her this is her last chance, and she will tell you, "Good, good. It'll be worth it, I assure you." Saying you've had enough for now will have her insist, "Well I really would like to make sure I've corrected what happened last time. Please give me a chance to try again." Brelyna will order you, "Okay, now don't move at all." as she readies her spell. You will be turned into a cow, and her reaction will be: "Oh my. That isn't right! Just wait. Just... I can fix this." She will cast another spell and instead transform you into a horse. She will say, "Oh no, that's not it at all. Let me try again..." This time you will turn into a dog: "This really isn't turning out the way I'd hoped." Brelyna will obviously be embarrassed over this as she tries to assure you, "I'll get it right this time, I swear." and return you to normal. "There, all better." When she finishes experimenting on you, Brelyna will say, "Well, it all worked out in the end, didn't it?" You can tell her to never speak of this again, and she will agree and express gratitude: "And thank you for your help. You're a good friend." If you instead tell her that it's been a pleasure she will deny it: "Oh, no it hasn't. Let's be honest. I have a long way to go before I'm ready for the kind of advanced magic I've been attempting. But at least I know where to start now. Thank you, you've been a great help to me." Brelyna was supposed to talk with Onmund about their families, but doesn't due to a bug. Brelyna: "Still no word from your family?" Onmund: "Have you heard from your family recently?" Onmund: "No, and I'm not expecting any." Brelyna: "No, not really. Couriers don't seem to like delivering letters here." Brelyna: "Really? That must be so nice. I came all the way to Skyrim just to get away from my family's expectations." Onmund: "Ah, that's too bad." Onmund: "My family didn't really approve of me coming here at all." Brelyna: "Not at all. It means I'm not being hounded about my progress at the College." Brelyna: "Oh. Well, that's... awkward. Sorry to have brought it up." She was also supposed to be approached by Arniel Gane for his research, which never happens due to the same bug. Arniel: "Do you think you might, err, have a moment to look at something for me?" Brelyna: "If this is another dwarven trinket, I keep telling you I'm not familiar with them." Arniel: "Yes, I just thought perhaps you'd have, err, come across something like this before." Brelyna: "Why, because I'm a Dunmer? We didn't all grow up in dwarven ruins, you know." Arniel: "Well, err, yes. Sorry to have troubled you." When recruited "Of course. Let's go." When asked to trade items "I'm a mage, not a pawnbroker, you know." When told to wait "As you wish. Just don't forget about me." When told to follow "Of course. Let's go." When dismissed "You'll be all right on your own? Then I'll see you back at the College." Brelyna shares a surname with Mels Maryon and Felen Maryon. 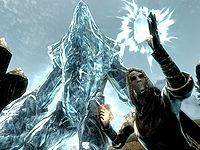 If you decide to marry Brelyna, her dialogue is the same as if she were at the College of Winterhold no matter where she is, until you finish The Eye of Magnus. She will still open a store and will give you 100 gold per day. If she moves to your house, dismissing her when she is a follower will have her reply with, "You'll be all right on your own? Then I'll see you back at the College." after The Eye of Magnus. 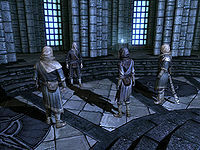 Brelyna will never initiate conversation with other College members, as all the scenes were set in the Hall of Countenance, where none of them will ever meet. As a stewardHF she may say she is going back to the College whenever she leaves your service as a follower, but actually goes back to the property of which she is steward. This bug is fixed by version 2.0.8 of the Unofficial Skyrim Patch. This page was last modified on 23 October 2018, at 10:18.